VoIP stands for Voice over IP which means that voice data is transmitted using a data connection. For example, your ADSL or Fibre Broadband connection. To establish a VoIP Telephony system, you need three things. The first is at least one IP phone that will plug into your switch or router. 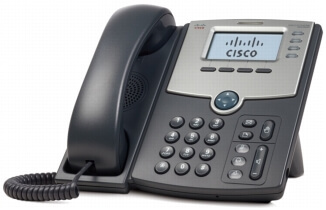 There are a wide variety of makes and models but our preference is the Cisco SPA504G. This handset gives you the ability to make use of great VoIP functionality. Plus, you get the 24 ring tone! Second up is what’s call a private branch exchange or PBX. This manages the connections of the phones within the business and also connects them to the outside world. The product we use is an IP PBX which is software based solution which is installed on either a computer or server but there are cloud based IP PBX solutions available too. Lastly you need what is called a Session Initiation Protocol Trunk also known as a SIP trunk. This allows your voice data to be sent via your internet connection to the SIP trunk provider who in turn connect your call. So what’s great about VoIP? The main selling point of VoIP is cost savings. While there is an initial outlay when purchasing the phones, software and perhaps upgrades to your internal network you can save big on line rental and call costs. For an example one prospective customer came to us with a bill of over £1500 for one month only. We compared this with a VoIP solution and were able to offer a saving of around 50% off this figure. …and it’s not just about saving money. If this sounds of interest and you want to know more, or you have any questions please get in touch with us.